Hello again, well April already and I've seen the odd Stag on the lanes of Cheshire. I've also had a few conversations about adding the finishing touches to the winter restorations with two new members asking about the carpets available from the Club Shop and how to fit them. Well, the first part was easy: contact Garth the shop manager, he will be pleased to discuss carpet quality and take the order for your new carpets, the second part, how to fit them? - reminded me of former Stag register secretary Richard Briscoe's article about fitting carpets in Courier issue 349 in July 2009. That's almost 5 ears ago, and the two new members did not have immediate access to Richards article (which is available on the Magazine Archive CD) so here is an abridged version of the article to help any other members who are considering fitting new carpets. In early 2009 Richard replaced the carpet in his Dad's Stag, here is what he had to say: The Stag carpet set is one of the easiest I've ever fitted. It is also one of the most time consuming to do right! 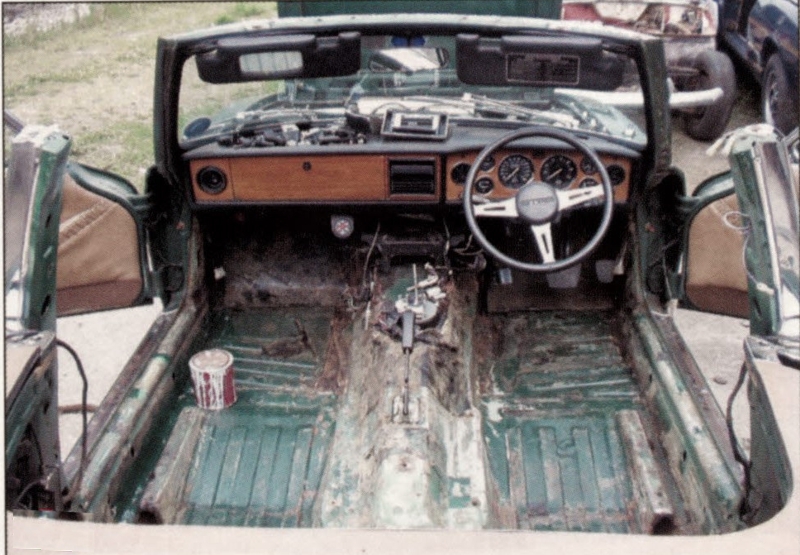 The first job is to disconnect the battery and remove the front seats and mats. On removing the seats there are four spacers, which sit between the seat runner and the floor, (photo 1) These lift the seat slightly above the carpet to allow the sliding mechanism to move freely. On cars with a seat belt warning light you will need to be extra careful when removing the passenger seat as there is a sensor wire connected underneath. 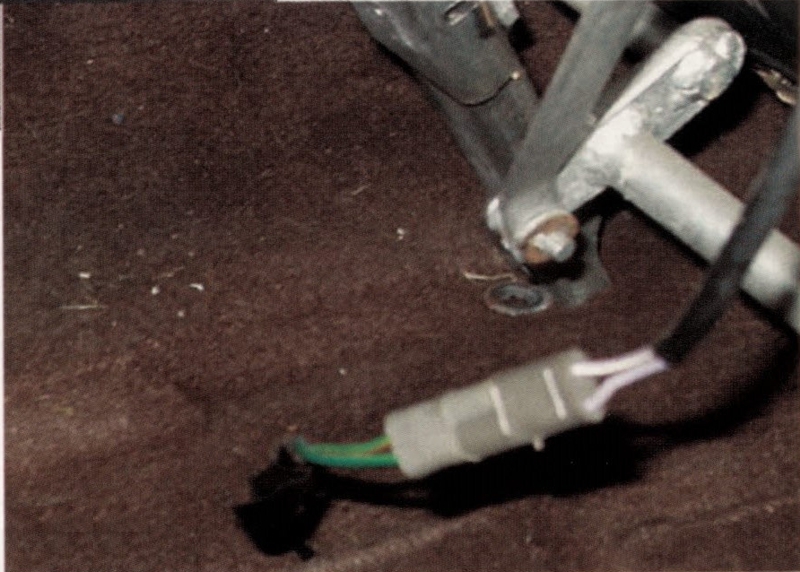 There is a grey connector block and the wires should be disconnected here (photo 2). 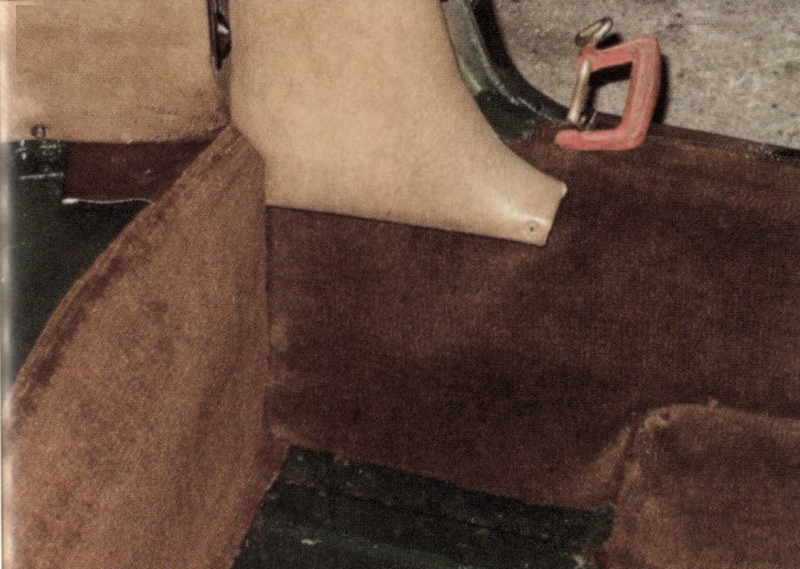 The rear seat squab can be removed next as :his needs to be removed before the heel board carpet can be removed. This is a decision to oe made next and it will all depend on the quality of your new carpet. Good quality carpet sets have a trim sewn in which fits over the access holes for the rear sub frame bolts iinder the rear quarter trim panels. (Photo 3). To fit this carpet neatly the rear quarter panels reed to be removed by undoing the five (or less depending on the cars history!) clips and the tvo screws on each side. It is very easy to rip the vinyl trim so be very, very, careful. The next choice is dependent on the quality of job you wish to make. The heel toard carpet and sill carpets both meet under the "B" post trim. Some f eop/e have saved time here and cut the carpet around the "B" post. I think you can make a better job ty removing the "B" post trims. Unfortunately this means you need to take out the seatbelts and r imove or loosen the T-bar. The centre console and parcel shelf now needs to be removed. This job is self-evident, but you n ave to be careful not to damage the plastic trim or the cardboard parcel shelf. 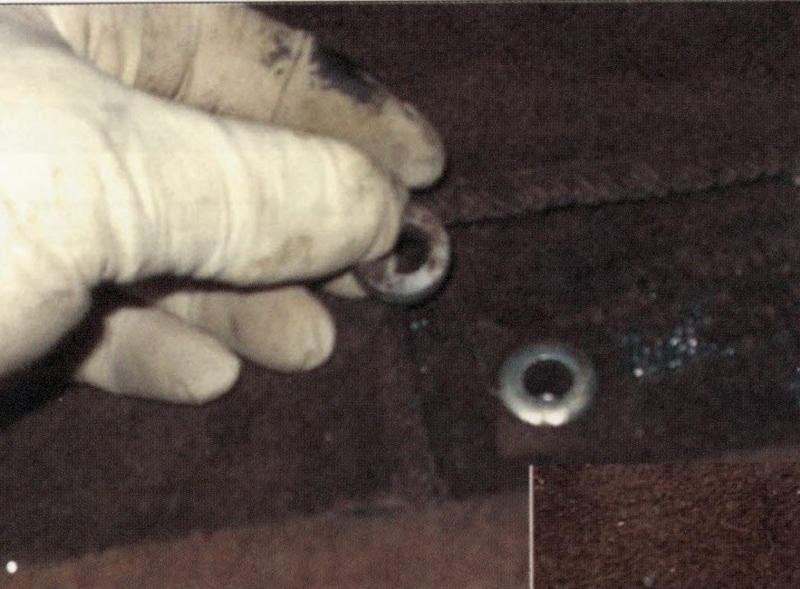 The final bit to remove is the seat belt buckle binnacle. This is done by opening the ashtray, removing the inner container then undoing the two screws to remove the ashtray completely. There is then a single screw at the rear right, which can be reached through this aperture. Once removed the binnacle can be knocked / pushed forward to disengage it from the buckles. Be careful if you are removing sensor buckles as the wires can be really easily damaged. One last job remains before the carpets can be carefully pulled out and then removed. There are two aluminium strips, one on each inner sill, which retain the carpet. Remove the screws and take off the door seal. The carpet can now be carefully removed. Watch out if it is stuck down in areas where wires are located to minimise pulling the wiring loom. Thoroughly check any damp sections of carpet as you remove it and use their location to check for any leaks. On my Dad's the driver's side the foot well was damp. Fortunately, it was easily diagnosed to the rubber heater hose being loose on the bulkhead side of the connection, which had caused seepage into the car on the driver's side. absorbent. To prevent them holding moisture, load them with wax oil! The two bulkhead to door joints will also e protected by doing this. Check your new carpet set has either a separate insulation / sound deadening pack or has them sewn in where appropriate. 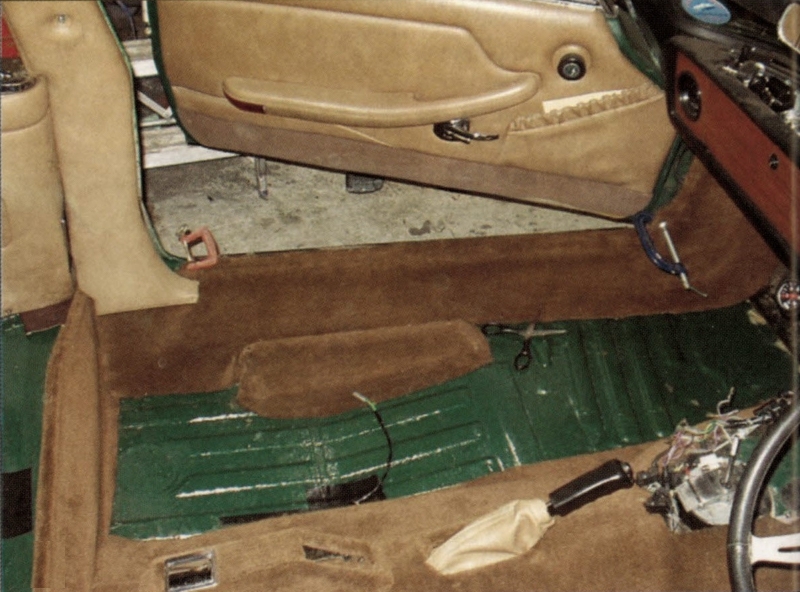 The carpets will fit better and last longer with the sound deadening in place. The kit I used was very good and had the insulation glued sewn in. The only drawback was piercing the carpet to find the boltholes for the trim. Refitting the carpet is much easier by comparison! You will need a large amount of good quality glue. The best I have found for carpets and trim is EVO Stick 528 industrial contact adhesive. It is difficult to get from DIY stores but is easily available from Screw-fix. It's not the cheapest but works! The main problem is knowing where to start! Make sure your hand brake gaiter is in place! (Photo 5) Many people forget and have to place the gaiter on top of the carpet. 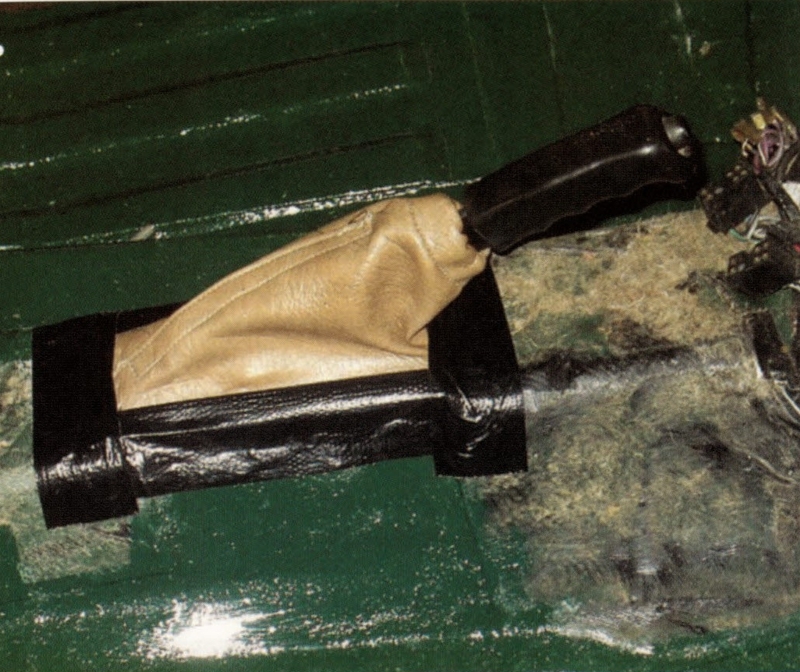 It is not secured from new but by using duct tape it stays in position like shown. I found the best place is to start by recovering the seat belt binnacle to practice your glueing skills and to get a measure of how quickly the glue sets. TIP 1 - Do not rush. The glue can take a while to dry, so be patient. You must work at a steady pace and know when to stop. I took four days to do my Dad's car working around other jobs and I believe the extra time was worth it. A rushed job will show. * The rear and front mats. Once the carpet is in place make sure the glue is set and no tools have been left around. You can then start to replace the "B" post trim and everything else that you removed initially. Your car should then look smart and tidy! Well, I hope that again helps any member planning to fit new carpets to their Stag. Do more with your Triumph!